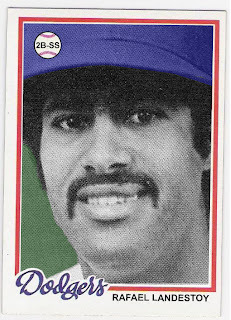 garvey cey russell lopes: the 1978 topps rafael landestoy card that should have been! 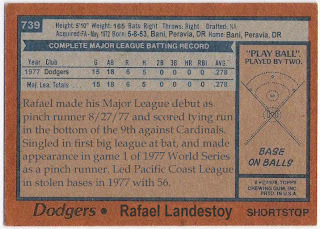 the 1978 topps rafael landestoy card that should have been! he was also featured in the dodgers' 1978 yearbook (extreme black and white closeup!) so i made a card using that image just as i did for ron washington. landestoy spent the first part of the 1978 season in the minors and was then dealt as the player to be named later in the july trade that brought joe ferguson back to la. an interesting trade as landestoy would return to the dodgers a few years later. 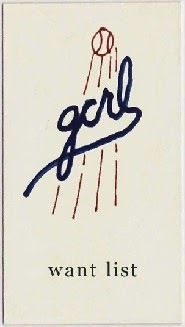 anyway, i think of landestoy more as a shortstop although he played more second base than short. 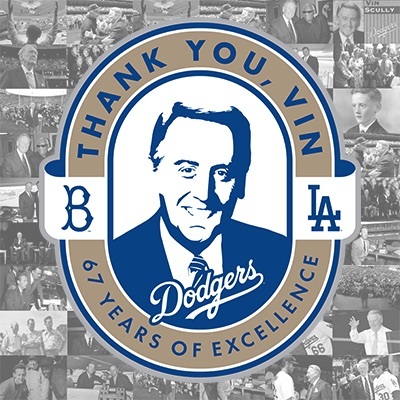 he debuted in the big leagues in the bottom of the 9th in a game against the cardinals as a pinch runner for manny mota and then scored the game tying run on a bill russell single. steve garvey won the game with a walk off sac fly a couple of batters later. landestoy's first big league hit came in a game against the reds a week or so later - an infield single off of pedro borbon. 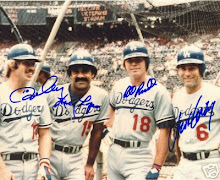 the dodgers, who had a 13 game lead in the division at this point, were in full coasting mode by then, as the players on the field at the time of landestoy's hit included ron washington, joe simpson, jeffrey leonard and glenn burke. landestoy didn't play in the 1977 nlcs against the phillies, but he did appear in the world series against the yankees. in game 1, with the dodgers trailing 3-2 in the top of the 9th, landestoy pinch ran for steve yeager who had walked with one out and dusty baker on first. a lee lacy single scored baker with landestoy moving to second, but davey lopes and bill russell stranded him there and the dodgers went on to lose in extra innings. 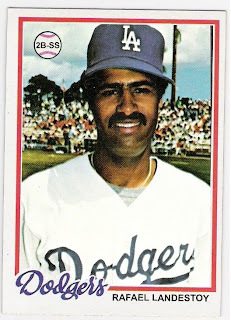 as i mentioned earlier, landestoy returned to the dodgers a few years later in one of the worst trades al campanis ever made, but i'll save that tale for the upcoming 'double dipper' post. 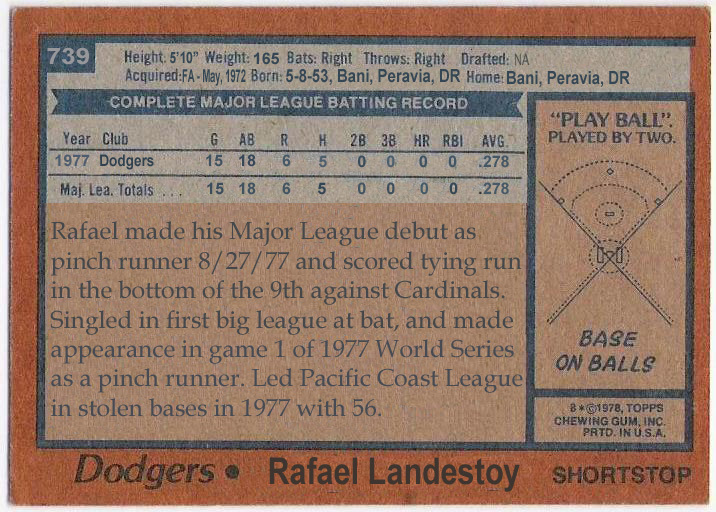 here's to you rafael landestoy and the 1978 topps card that should have been!